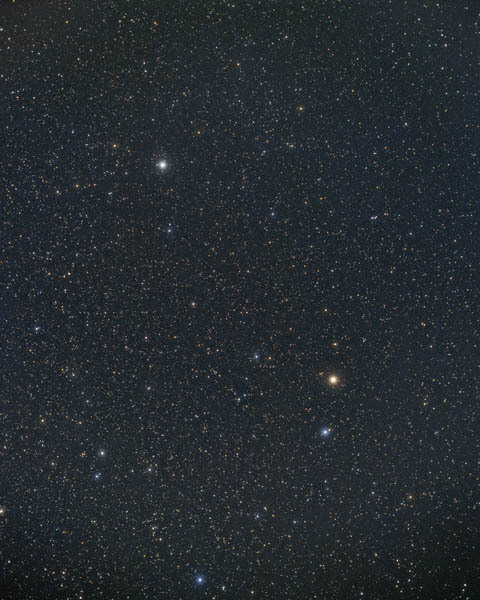 In the picture above north is around Polaris and the image covers 29.3 x 36.7 degrees. Image centre is located at 23:57:26.6, +74:17:18 (H:M:S, D:M:S, J2000) Astrometric data from Astrometry.net. Ursa Minor (the Little Bear) is intimately linked to Polaris, the North Star which may be found at the end of the trail of stars that look like the Little Dipper. Ursa Minor does not appear have any mythology associated with it, rather it was first mentioned in the 6th century B.C. by Thales of Miletus as a navigational aid for Phoenician sailors. On the other hand, in the mythology of Ursa Major, two bears were flung into the sky by their tails by Zeus, in a fit of jealousy. The throw was so violent that the bear's tails were elongated. Alifa al Farkadain (ζ UMi), Kochab	(β UMi), Pherkad	(γ UMi), Polaris (Pole Star, α UMi), Yildun	(δUMi). Constellations adjoining Ursa Minor: Camelopardalis, Cepheus, Draco.